There are certain things in life that I am passionate about — golf is just one of them. But I am also a fanatic about marketing communications that come to me in the manner and frequency that I want. Companies who honor my preferences are more likely to get my business — and my continued loyalty. Doesn’t sound complicated, does it? Yet, I am constantly amazed at the number of marketers who just don’t get it. They invest big dollars and a lot of time and effort into campaigns that they think are relevant for their target audience. But too many times they don’t let the audience have a say in terms of the kind of content that they wish to receive, the desired media such as email, text message or direct mail, or the frequency of the communications. I am a preferences fanatic. I like the ability to tell a company my preferred communication channel, my specific areas of interest and even how often I want to receive their messages. Companies who bombard me with messages that are not relevant to my interests or who insist on calling me when I prefer email will soon fall out of my favor. Take my bank, for instance. I am a homeowner, so I might be interested to find out when interest rates drop or if there are new options for refinancing. But I am not interested in offers for new credit cards. And, I prefer email over phone calls or postcards. Considering the sheer volume of emails that I receive each day, about once or twice a month is all I that I would care to hear from my bank. So, how can a company honor my preferences? The simplest and most effective way is to offer an online preference center that makes it easy for me to express my detailed opt-in and opt-out preferences based on product or contact channel. 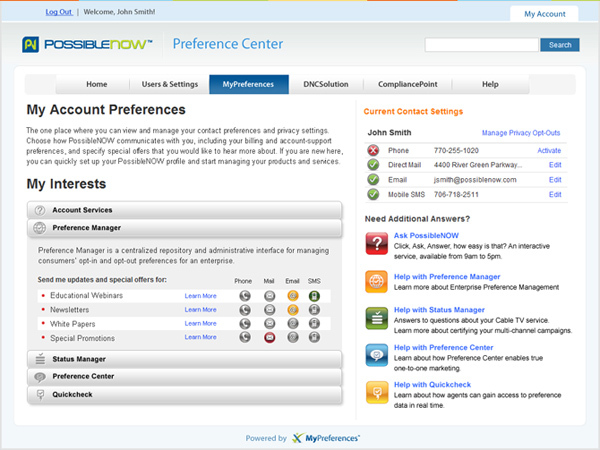 The preference center provides the organization with a centralized, single view of my preferences. My bank could remind me in my regular monthly statements to update my preferences in their online preference center. That way, when I do take advantage of a refinance offer, I could “opt-out” of that content and “opt-in” to hear about their other services that might be of interest. And if I change my mind and decide that I do want direct mail instead of email, I’d have that option, too. Show me your preference center and you may win my business and loyalty!